Being a light, according to Scripture. As the image above cites, the Torah is light. While the quote says, ‘a light,’ the Hebrew has no article. It says, ‘Torah light.’ This is a simple fact that defines the term ‘light’ in order for us to insert the definition elsewhere. Much like those lovely equations we learn about in sixth or seventh grade, we can now define a variable. In the following example, we can solve for the variable. 2X + 5 = 3X – 1 Other equations require that the variable be defined for us, as an example 4Y – 6 = ???. We can insert anything at ‘Y’ and get an answer, however, if we do not know what the tester’s definition of ‘Y’ is, we are highly unlikely to arrive at the correct answer. When Yeshua says, ‘you are the LIGHT…,’ He is not speaking indefinitely, rather, He is using specific terminology the hearer understood. We can evidence this through other verses and passages that demonstrate a co0mmon reference to Torah as light. Yeshua, being the living Word, and the Word made flesh, rightly refers to Himself as the Light of the World. Yeshua perfectly kept the Torah and we are commanded to imitate Him. The question is, what ‘word’ is the psalmist talking about?… Oh, yeah, the whole psalm is recounting the glorious riches and value of the Torah. [/sarcasm] This perfectly confirms everything we have discussed thus far. Isa_2:5 O house of Jacob, come ye, and let us walk in the light of the LORD. Isa_5:20 Woe unto them that call evil good, and good evil; that put darkness for light, and light for darkness; that put bitter for sweet, and sweet for bitter! 20 To the [a]law [TORAH!!!!] and to the testimony! If they do not speak according to this word, it is because they have no dawn (or figuratively, light). Our unmistakable conclusion is that the Torah is light and we are commanded to display that Light just as our Redeemer did and does. Those who want to be a light will walk Torah. Keeping part of it is diminishing the Torah and dimming the Light of the World by not displaying the fullness of His glory. I adjure you, dear reader, to walk Torah. It is THE path of righteousness. Come out of the lies and paganism that we inherited from our fathers. Return to the paths we were covenanted to at Sinai! 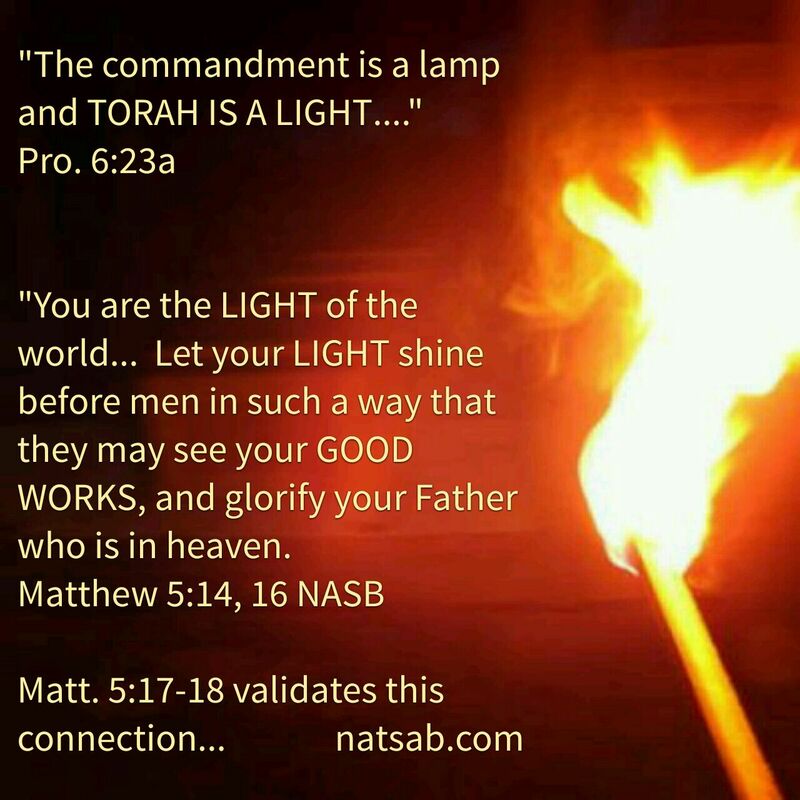 This entry was posted in A Thought... and tagged inerrant Scripture, Light of the world, new testament validates torah, walk in darkness', word is a lamp, you are the light. Bookmark the permalink. 4 Responses to Being a light, according to Scripture. Reblogged this on Glory to YHWH. You NAILED it, Pete!!! Thanks!!!!!! Near the top of the right hand column are two ‘Follow’ buttons. One is for WordPress users and the other for email users… For some reason, I can’t enter your email, but I’m sure you can. That is your best bet. Thank you so much for your interest and support. Blessings in Yeshua!